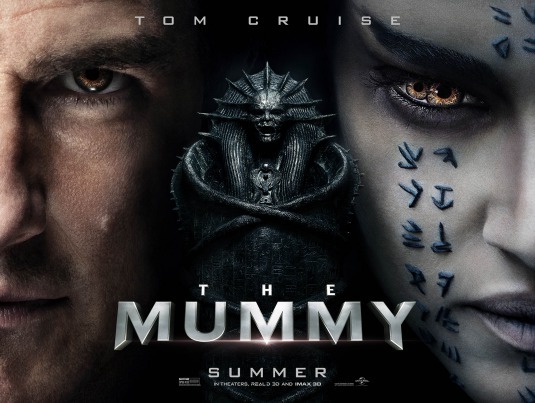 Just a heads up, this is NOT a reboot of the “The Mummy”(1999) film starring Brendan Fraser. Universal Pictures has relaunched classic monster movie characters as part of the Dark Universe franchise, beginning with “The Mummy” (2017). Tom Cruise plays Nick Morton, a US soldier in Iraq who in his free time steals priceless antiquities with his reluctant partner in crime, Chris Vail (Jake Johnson). During one of their “hunts for gold”, the two men and archaeologist Jenny Halsey (Annabelle Wallis) stumble upon the remains of Princess Ahmanet (Sofia Boutella), who was entombed for eternity after her treacherous acts of evil five thousand years ago. By uncovering her remains they have also awakened her spirit, allowing Ahmanet to finally finish out her plan to rule the world. Okay, so the plot is pretty thin and hardly original, but the movie does have it’s entertaining moments thanks to Cruise and Johnson’s comic relief and the constant action-packed sequences. The film also eases us into another Dark Universe character, Dr. Henry Jekyll, adequately played by Russell Crowe. Though his character was there to study Ahmanet, and be another obstacle for Nick and his quest to escape the supernatural madness, somehow Dr. Jekyll felt forced in this story. However, the possibility for an interesting Dr. Jekyll is there and I’m looking forward to seeing Crowe as the lead in a Jekyll and Hyde origin film. “The Mummy” as a whole isn’t much to brag about. The entire cast does a decent job, and the story is very basic. What we currently have here is an average, but fun fantasy adventure that has gotten the ball rolling on what is suppose to compete against Marvel and DC movies. Luckily, “The Mummy” has set the bar real low for the future Dark Universe films. This film will probably get a lot of negative reaction as it brings nothing fresh beyond some jokes and cool CGI. Yet, I can’t help but see potential in what’s to come. Once the franchise finds its footing and brings this world together in a more natural way, it could be something special? Or maybe I’m just being optimistic, who knows! In a summer filled with anticipated blockbusters it’s hard to say that “The Mummy” will rise above movies like “Guardians of the Galaxy Vol. 2” or “Wonder Woman”. However, if you’ve already seen those two films and you’re looking for a quick thrill to satisfy you in theaters till “Spider-man: Homecoming” comes out, then “The Mummy” is worth a few bucks. “The Mummy” opens in theaters June 9.